Last visited by Zerver on Dec 24 98WIK’s is a tavern/armory combination. 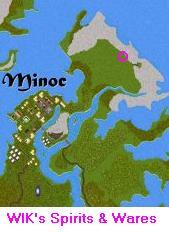 It is run by the WIK guild, and resides in the city of Imperium. There were many vendors in and around the Imperium, as well as an open forge, and an open training hut. Bill Alric (actually there are many Alric’s in the Imperium) conducted a tour of the place. Right next to the Tavern is a forge/anvil that was left when a house decayed. He said that at times, they use the anvil for an outdoor smithing contest. He also said they often set up tables and chairs in the gaps around the Tavern for some more open air Drinking and chatter.